A Happy and Healthy New Year 2018 to you and your family. 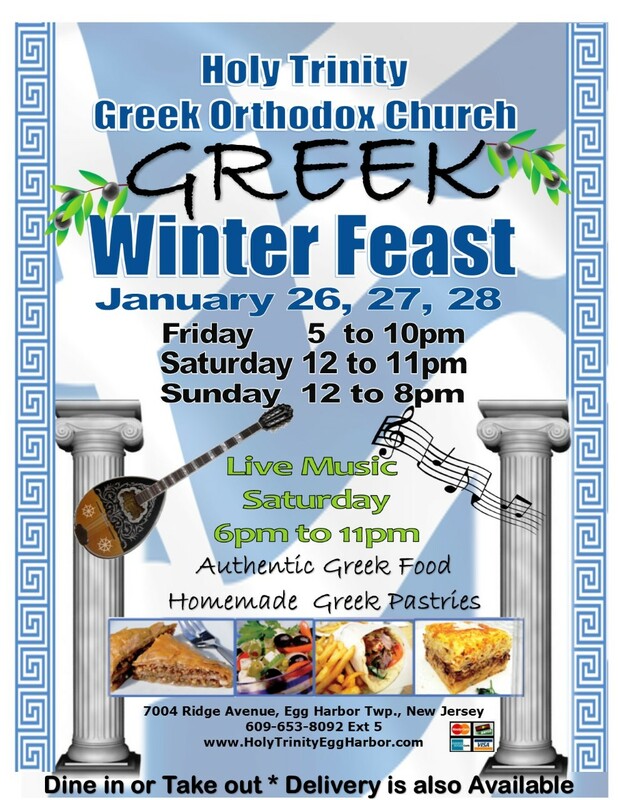 Save the Dates for our 10th annual Greek Winter Feast! Beat the winter blues with the warmth of Greek hospitality. Come and join in the fun and savor authentic Greek food and homemade Greek pastries. Bring your friends and family to eat in or order for take-out or delivery. With the great success at last year’s Winter Feast, we are happy to announce again, our Taverna evening, with live Greek music by the band, Thalassa, Saturday, January 27 from 6pm-11pm. Dance away the evening with us! Come and Join our Holy Trinity family for a fun filled Winter Feast! Church Tours are some of the exciting offers. Friday: Jan. 26, 5 to 10 p.m.
Saturday: Jan. 27, Noon to 11.00pm. Live Music by Thalassa and Taverna evening, from 6 p.m.
Sunday: Jan. 28, Noon to 8 p.m.
7004 Ridge Ave., Egg Harbor Township. Dine-in, take-out, and delivery available.